Verizon Wireless sold out of its Apple iPhone 4 pre-orders in less than 24 hours, setting a company record for a first-day phone launch, Verizon announced Friday. 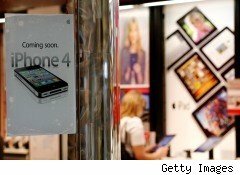 Wannabe Verizon iPhone 4 owners who got shut out should plan their strategy now for camping out at stores next week. Beginning before dawn yesterday, iPhone 4 pre-orders to existing Verizon customers "flew out the door" via the company's website. "In just our first two hours, we had already sold more phones than any first-day launch in our history. And, when you consider these initial orders were placed between the hours of 3 a.m. and 5 a.m., it is an incredible success story," Dan Mead, chief executive officer for Verizon Wireless, said in a statement. The company didn't disclose sales numbers. Overall, according to a MacRumor's post, Verizon's allotment for iPhone 4 pre-orders lasted only 17 hours before running out. Demand for the iPhone on the Verizon (VZ) network has been building up for several years, as loyal Verizon customers lusted after the souped-up handset that was only offered on the AT&T (T) network under an exclusive U.S. distribution agreement with Apple (AAPL). But earlier this year, Verizon announced it had struck its own phone deal with Apple and would offer pre-sale orders to existing customers on Feb. 3, with the general public getting access online on Feb. 9 at 3 a.m. EST and Feb. 10 at Verizon and Apple stores at 7 a.m. local time. Best Buy (BBY) and select Walmart (WMT) stores will also carry the Verizon iPhone 4. As with many Apple product launches, you can expect to find long lines and sleeping bags. Last summer, when the iPhone 4 launched on the AT&T network, customers set up tents, folding chairs and blankets on sidewalks outside of Apple stores. Even though the iPhone 4 has been out for over seven months, analysts still anticipate customers eager to lay their hands on the Verizon phone will camp out ahead of the Thursday launch. "I do believe there will be typical 'Apple Camps' created outside Verizon and Apple stores in anticipation of the Verizon iPhone," says Brian Marshall, an analyst with Gleacher & Co. "Basically it is the match made in heaven with the nation's best smartphone pairing up with the nation's best network." Another Wall Street analyst expresses a similar sentiment: "It seems like there is an amount of pent-up demand for it, but I don't know if it will be as much of a spectacle as last summer." Long lines and camping out result from fear that customers will be shut out of making an immediate purchase due to shortages, like those experienced with the launches of the iPhone 3G in 2008 and the iPhone 4 in 2010. Analysts are mixed on their expectations that Verizon and Apple will be hit with an iPhone 4 shortage. Jonathan Goldberg, a Deutsche Bank analyst, says: "I think there's a high degree of likelihood they'll run out and be capacity-constrained for some time. With the iPhone 4, it took two months to catch up with demand. It takes time for the supply chain to catch up." However, one analyst says he believes Verizon and Apple have been preparing for the launch for some time and component shortages have been elevated since early January. Says another: "If the demand environment is significantly more robust than expected, it's possible that there will be a shortage. But after Verizon's Droid shortage, they're probably prepared for it." Last summer, Verizon sent out $25 gift cards to all its customers who were put on ice while waiting for their HTC Droid Incredible phones to arrive. Customers waiting overnight for a phone launch at a Verizon Wireless store is a rare, if ever, event. The iPhone 4 is expected to change that. "I've never heard of people camping out at a Verizon store, but there's been isolated cases where they've lined up on the day of a launch before the doors opened," Goldberg says. Brenda Raney, a Verizon Wireless spokeswoman, says she can't speculate whether customers will spend the night waiting in line, but she notes that store managers are prepared should that happen. She says some may pass out coffee or coca to customers in line. It's all very store dependent. The bigger and more visible the store is the more people will be camping out most likely. I will be staying away from Apple stores if I can't get mine ordered on the [Feb.] 3rd because they are very high traffic/profile around me. My friend works at a Verizon store, in fact I got him the job when I worked in the industry a few years back, and if I have to camp out he's going to keep an eye on the line for me prior to closing on the 2nd and give the heads up on if I should come earlier or how it's looking at close. You may want to look for the more remote Verizon "Owned and Operated" stores. Stay away from Apple stores since they're few and far between, and will probably be much busier. Although they may be a more "fun crowd" to be with while you're waiting. Another commenter, Raney, had similar advice, with a twist: "If you live between an urban area and rural area, I would pick the rural area. Use your concert strategy," Raney said. "I would use the same thought and strategy I would if I were buying concert tickets. Pick places with the least amount of people. All our stores will have iPhones."